Let the collections at Frida Kahlo Museum and National Museum of Anthropology (Museo Nacional de Antropologia) capture your imagination. Historic Center (Centro Historico) and Museo del Templo Mayor will appeal to history buffs. Change things up with a short trip to Zona Arqueologica Teotihuacan in San Juan Teotihuacan (about 1h 20 min away). There's much more to do: take a stroll through Coyoacan, contemplate the long history of Metropolitan Cathedral (Catedral Metropolitana), explore the wealth of natural beauty at Chapultepec Park, and pause for some serene contemplation at Basilica de Santa Maria de Guadalupe. 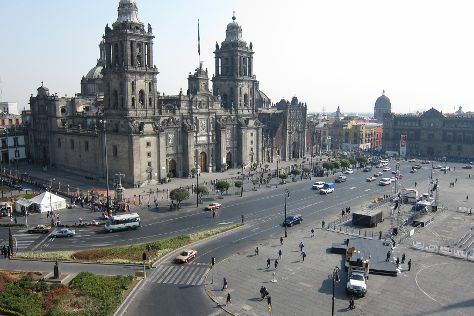 To see where to stay, more things to do, reviews, and tourist information, go to the Mexico City route planning website . If you are flying in from Colombia, the closest major airports are Licenciado Benito Juarez International Airport, Querétaro Intercontinental Airport and General Francisco J. Mujica International Airport. In August, daytime highs in Mexico City are 28°C, while nighttime lows are 16°C. Cap off your sightseeing on the 19th (Mon) early enough to travel back home.